Roger Paul Wick, was born July 27, 1963 to Harold (Zip) and Elaine Wick. Roger Paul “Loose” lived his entire 55 years on the Wick family farm. Roger loved farming, ranching, and family. Living life to the limits, his philosophy of life was “Hammer Down”. On September 11th in a well-known gathering spot on the farm overlooking a pasture, his cattle quietly grazing, he ended his life. The rustling of the wind through the cottonwoods at that time and place offer quiet solace to his grieving family. Although depression encumbered his last few years, family and friends remember a Roger of happier times. A farmer from birth, his boots were always parked right next to his dads. He rode shotgun in the old pickup truck until he was able to take the wheel himself. After Zip and Elaine retired, Roger bought the farm. He expanded the acreage and was an early advocate for natural beef production. He sought business opportunities and developed a personal network of customers to market his natural beef. When he wasn’t farming, baling hay or riding herd on his prize cattle, he hunted, gardened exotic vegetables, and delivered Loose Meat around the country. He made the best darn dill pickles ever and played a mean game of pinochle. He surrounded himself with trophy game. A big horn sheep hunt in the North Dakota Badlands in 2002 ended successfully with a ram he named Hank, a once in a lifetime moose hunt in the Turtle Mountains filled the freezer and in 2009 he received the North Dakota Limousin Commercial Beef Producer of the year award at the Minot State Fair. Colorful Western shirts, tight fitting wranglers, boots and a hat, his slim, 6 foot presence always brightened family gatherings when he rolled in with a cooler full of homemade sausage, Loose Meat and home canned goods. He is missed by brothers Ron, Harold (Lorra, Harrison), Rudy (Kathy, Kelsey, Sean, Emery, Jacob), Howard (Sarah, Grace, Lilly, Lane), Tim (Stacie, Andrew, Zachary, Nathan, Rose Mae, Eleanor, Trinity) and sisters LaDonna (Erling, Patricia, Simon, Godddaughter Natalie, Joe, Stephanie, Mark), Sandy (Merle, Kimberly, Mike, Alexis, Remington, Samantha, Eric, Lisa, Riley, Tucker, Cassie), Joni (Whitney, his Godson Hunter, Nakoia), Sarah (Andre), Tracy (Dan, Casey, Tom, Carter, Josephine) Kristina and Melissa (Keith, Erin, Jordan). Roger passed from this life into the arms of his loving parents who preceded him in death. In lieu of flowers or monetary donations, his family requests support for suicide prevention programs. 1 mile south of New Rockford on Hwy. 281 and then turn East on 17th St. for 2 1/2 miles. Sorry to hear about Roger. Our thoughts and prayers are with you! So sorry to hear about Roger. So sorry for your loss of Roger, he was a good person with a kind heart, will miss him also. Prayers to the family and friends. 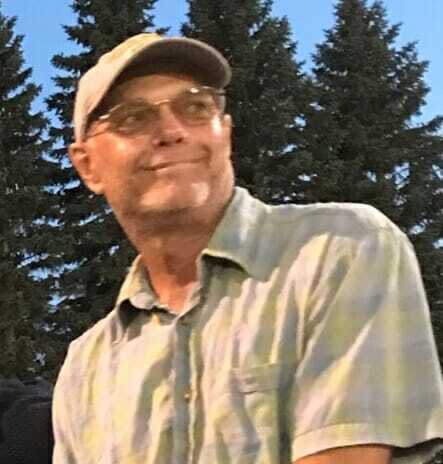 Thoughts and prayers to Roger’s family – RIP “Loose” – you will be missed by many! I am heartbroken about Loose. Many memories of fun times with Loose in our younger years, and they all make me smile. He was a good guy and friend! I share in your sorrow with love and friendship. Much love and prayers to all the Wicks! I have many wonderful memories of spending time at the farm and your parents were the best!! Silent “Mr Wick”…always stoic with that sweet smile! Your mom was one of the loveliest, kindest ladies I knew! Maybe a blessing that Elaine passed before Roger. They now welcome Roger with open arms, along with Myrtle and Leonard Dyrness (Rogers God-parents). Lots of pinochle being played in Heaven, I’m sure! RIP, Roger. Prayers for the Wick family!!!! So sad…..Roger was a great guy. So nice and friendly any time I saw him. RIP Loose!!!!!! God bless your soul, Roger. May your passing bring you peace. I pray that all the family and friends in your life find understanding where there appears to be none. May your passing give us each a spark … just a spark … to help someone in a time of need. Peace be with you, Loose. So sorry for the loss of your brother. Prayers and hugs to all. Peace and with Harold & Elaine. Keep the memories alive, God Bless you all. Our condolences to the entire Wick family. Roger was a such great guy. While I haven’t seen him now in some time, I have many fond memories of growing up with Roger. Many years of friendship, fun and mischief during our years at St. James and New Rockford High School, right through our graduation party at the Wick family farm. Roger always had a smile on his face and a warm and greeting handshake whenever I would see him. I will miss you bud, rest in peace! So sorry to hear this sad 😔 news. What a Beautiful tribute to Roger who had such a gentle and humble spirit & smile. Prayers for his brothers & sisters, family & friends. Was so saddened to hear about Loose. When I think of him I always see a big smile. Mitch told me about the gardening and canning Loose did, quite impressive. Hugs to the Wick family, you have always had a special place in my heart. My condolences to all on the loss of Roger. His obituary was well-written and a great tribute to Roger. My thoughts and prayers to all of you. Our prayers and most heartfelt condolences to your whole family. May Roger’s soul rest in peace. My thoughts and prayers are with Roger and the Wick family. I will continue to cherish the great memories with Roger (Loose). Roger was a soft-spoken, smart, funny and kind guy. I feel blessed to have been friends with him during high school. I always admired and respected the Wick family; still do. “Merciful God, hear the cries of our grief, for you know the anguish of our hearts. It is beyond our understanding and more than we can bear.” God Bless Roger and the Wick Family.